As Jacketed Hopper is used as pharmaceutical machinery or food-processing machinery component, its contact part is precisely made with the high-quality food grade SS 316 Quality Hopper materials. Upper part of SS Hopper is round while lower part is the conical shape with narrow ends. Inside cone bore size is 30mm and outer cone bore size is 90mm, which are very small and difficult to bend with taper rolling machine as it is skillfully fabricated in our fabrication shop. Inside finishing of hopper is mirrored and external finish of hopper is matted or as per the requirement. 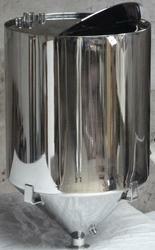 Looking for Jacketed Hopper For Product Manufacturing ?